As regards civil jurisprudence, are opposed France of statute law, including the southern half of the country and Alsace, which applies a right inspired of the Roman law (Justinien Code), and France of oral law, applying a common law, which varies from one area to another. It is estimated that there are 60 general customs (the most important is the Paris custom) and approximately 300 local customs. Taking as a starting point the various attempts at coding tried under Ancient Regim (Drafting of the habits by the ordinance of Montilz-les-Tours in 1454, Code Henri in 1585, Code Marillac in 1614), the French National Assembly issues on April 5,1790 that it will be made a Code of the civil laws of the kingdom. The Convention quite naturally instructs the Committee of Legislation to present to her a Civil law project. Cambaceres, its president, is harnessed with a task which was to last ten years. - to approach the natural right as much as possible, because the natural laws are higher than all the others. - to maintain a unit complete in the legislation, because the truth is one and indivisible. - to bring most extreme simplicity in the legal regulations, because few laws are enough for the honest men. This project made up of 695 articles divided into two parts: the people and the goods, included many innovative provisions on social matters. The right of the people regulates the births, the majority fixed at 21 years, the marriage, the divorce and the death. The ideas of the Lights are illustrated in particular in the definition of the relationship between the parents and the children: “Monitoring and protection here are rights of the parents; to nourish, raise, establish their children, here are their duties. The children will be equipped by learning, as of their tender childhood, a trade of agriculture or mechanical art. (...) The children of the fatherland will show their harvests, their cultures, their work and they will say emulously astonished : here are our treasures.” (Cambaceres). The text removes, for the same reasons the concept of illegitimacy and reform the principles of the adoption: “The adoption is the foreign branch graft on an ancient trunk; it revives the sap of it; it embellishes its stem of new kids; and, by this happy insertion, it crowns the tree of a new harvest of flowers and fruits. Admirable institution that you had the glory to renew and which binds so naturally to the Constitution of the Republic, since it brings without crisis the division of great fortunes.” (Cambaceres). The project institutes the divorce, which can be required by one of the husbands near the board of guardians, the marriage being dissolved 15 days after the request, as well as the payment of an alimony to the ex-husband who assumes the guard of the children. The right of the people finishes by treating supervision, interdicts and the absent ones. In the second part, Cambaceres treats means of acquiring and of preserving the property, then rules of provision of the goods. In particular the rules of succession, conventions and the mortgages are reformed. As regards succession, the project keeps only two testamentary forms: the donation inter vivos and the hereditary donation. All the children share the family inheritance equally, except for a negligible share whose head of household can lay out with his own way. On August 9,1793, he presents, in the name of the committee of legislation, his first civil law project. But the Convention issues the adjournment at eight days and the discussion begins only on August 22. In the preliminary speech, Cambaceres says “Citizens, it finally arrived this so desired time which must fix forever the empire of freedom and the destinies of France. The Constitution required everywhere with transport, was received from all the good citizens with the feeling of admiration and the recognition. (...) Your work is not still finished. For having gone a long time on ruins, it is necessary to raise the large building of the civil legislation; simple in its structure, but majestic building in its proportions; large by its simplicity even and all the more solid that, not being built on the sand driving of systems, it will rise on the firm ground of the natural laws and on the virgin ground of the Republic.” (Cambaceres). The Convention begins the reading and the discussion of the various articles. The discussion stumbles on the equality of the husbands, and under the impulse of Merlin of Douai, the conventional ones reject the article instituting the joint management of the goods of the household. Some articles are then voted, in particular on the divorce, but the Montagnards taken along by Levasseur and Fabre d'Eglantine find too much the project inspired by the spirit of the men of law and make vote a decree establishing a commission of 6 philosophers charged to reform the project. Here the examination of the first project of Civil law finishes. After Thermidor, Cambaceres presents a new Civil law project . In accordance with the wishes of the Convention, this Code is very brief (287 articles). Cambaceres divided the civil legislation into 3 parts according to a ternary articulation which prevails still today (people, goods and obligations). This principle of division is explained in his preliminary speech: “Three things are necessary and are enough with the alive man in company : to be a master of his person ; to have goods to fill his needs ; to be able to lay out, for his greater interest, of his person and his goods. All the civil laws are thus reduced to the rights of freedom, property and to contract.” (Cambaceres). The project contains some innovations compared to the precedent. The equality of the husbands is reinforced by the suppression of the paternal authority and its replacement by a joint authority on the children. The adoption is favoured by extending the right to adopt with any citizen: man or woman, married single person or (with the assent of the spouse), but it are framed, because there must be "the distance from puberty between adopting and the adopted child." On September 9,1794, Cambaceres goes up to the platform to defend his project, Vialles notes that the tone changed : “legal science replaced the philosophical tenderizing there”. The Convention rather quickly votes the first 9 articles. The discussion takes again three days later, it tramples and only the tenth article is voted. The unit is returned for revision before the Commission of the Eleven to which Cambaceres and Merlin of Douai are assistant, which causes to close the discussion of the second project of Civil code. On August 26,1796, Cambaceres goes up again to the platform to defend his civil code law: “Today that all is changed in the political order, it is essential to substitute for the old laws a code of simple laws.” (Cambaceres). He is attacked by the conservatives of Five hundreds, which considers certain provisions immoral (divorce, rights granted to the children born except marriage and the principle of equality of the heirs). On January 22,1797, he succeeds in making adopt the plan of the Civil law, several articles are adopted in the tread, in particular on filiation. But on February 26, certain deputies reconsider the plan adopted previously and Cambaceres understands that the examination of the project will not progress any more (on May 23,1798, the Council of Five hundreds still discusses the preparatory indications on the order to follow to examine the project of Civil code). - Bigot de Preameneu Felix-Julien-Jean (1747-1825) : Lawyer at the Parliaments of Rennes then of Paris, it is named to adviser of State in 1801. President of the legislation section in the Council of State, it succeeds Portalis as minister of religion. - Maleville Jacques de (1741-1824) : Elected with the Council of Ancients, it is named in 1801 with the Cassation Court, of which it chairs the civil section. Maleville is named senator in 1806, then count of the Empire in 1808. - Portalis Jean-Etienne-Marie (1745-1807) : Lawyer at the Parliament of Aix, Portalis is elected with the Council of Ancients. Condemned to the exile, it returns after the 18 Brumaire. Commissioner the government to the Council of the catches, then to advise State in 1800, he becomes minister of religion in 1804. - Tronchet François-Denis (1726-1806) : Lawyer and jurisconsult, Tronchet is elected in the Estates-General. Defender of Louis XVI, then elected with the Council of Ancients, he becomes president of the Cassation Court in 1800. Appointed senator in 1801, it rests in the Pantheon. On January 21,1801, the commission submits his report for opinion to the cassation court and the courts of Appeal. 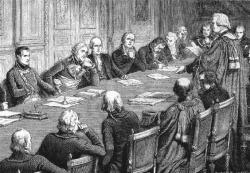 The discussion of the Civil law starts in plenary assembly of the Council of State on July 17,1801. The texts are forwarded to the Tribunate progressively progress of the work. On December 12,1801, the Tribunate rejects the preliminary title: Publication of the laws by 142 votes against 139, this rejection is confirmed by a vote of the Legislative Assembly. On January 2,1802, the government withdraws the bill and allows the tribuns to make observations before the vote of the texts. On September 9,1802, the discussion is resumed with the Council of State, the meetings are chaired by the First Consul or the Second Consul in his absence. Cambaceres prepares all work by communicating the documents relating to the agenda, as well as the extracts of his three codes, which is worth to him some criticisms on behalf of the advisers of State who find these preceding projects too impregnated of the ideas of the Lights or the Revolution. 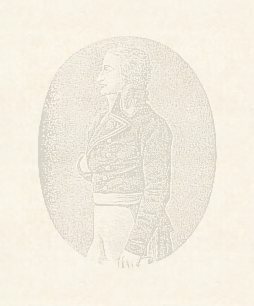 It carries out practically all the debates, Bonaparte known as of him: “Cambaceres makes the lawyer general; it speaks sometimes for, sometimes against”. On the 109 meetings of the Council of State necessary to the discussion of the Civil code, 52 are chaired by Cambaceres. The influence of the First Consul results in a very Mediterranean design of the family subjected to the authority of the father of family, while the influence of Cambaceres allows the introduction of the divorce by consent and a recognition of the adoption in conformity with the preceding projects. On March 8,1804, one carries out the classifications of the 36 laws and the numbering of the standard articles single. Bigot of Preameneu proposes a complete revision of work, Cambaceres is opposed to it: “The correction of the faults and typographical errors is of right ; but a general revision would have serious disadvantages. One would amount from there remaking the entire Civil code, and independently of the delay which this work would involve, it would have of another effect to only substitute for provisions adopted after ripe examination, of the provisions of which all the merit, perhaps, would be to be new, and who would not have more than the reformed provisions not received the sanction of time and the experiment.” (Cambaceres). On March 10, he suggests melting the various laws in only one called “French Civil law”. The law which contains 2281 articles divided into 4 parts : the application of the laws, the goods, the people and the property, are promulgated on March 21,1804. Maleville proposes to repeal all the old laws and to prohibit with the courts to quote them “like written reason”. The first proposal receives the approval of the Second Consul who regards it as useless, but he is opposed to the second: “It is impossible that the Civil code contains the solution of all the questions which can arise. Consequently, one should not deprive the courts of the advantage of drawing their decisions in other authorities.” (Cambaceres). Thus is completed a task started here are almost thirteen years.